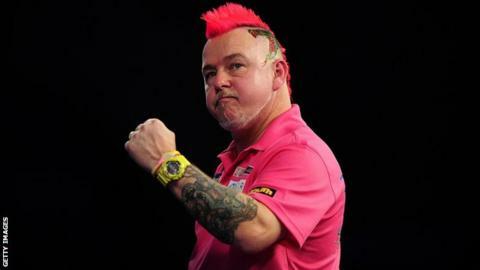 Peter Wright maintained his 100% start to the 2016 Premier League with victory over James Wade in Dublin. Suffolk-based Wright beat Wade 7-4 for his third straight win. But PDC world champion Gary Anderson suffered his second successive defeat, losing 7-4 to Phil Taylor. Dutch duo Michael van Gerwen and Raymond van Barneveld both won on Thursday, while Dave Chisnall drew 6-6 with Michael Smith. Smith's result left Scottish pair Anderson and Robert Thornton, who lost 7-5 to Van Barneveld, as the only players yet to register a point in this year's competition. Defending Premier League champion Anderson was absent in week one because of illness and has since lost to Van Gerwen and Taylor. World number one Van Gerwen followed his victory over Anderson in Newcastle seven days earlier with a 7-4 success over Adrian Lewis, who fell to his first defeat of the tournament. Wright, who averaged more than 104 against Wade, has a two-point lead at the top of the table.